Part 1 (overview) of this 7-part series, which is taken from a recent presentation I made at UCLA, can be found here. Part 2 (monetary policy) can be found here. Federal tax receipts are now rising at double-digit rates, which is typical following a recession, as incomes and profits rise and more people go back to work. The federal budget could be balanced in 5 years if spending just stops growing. 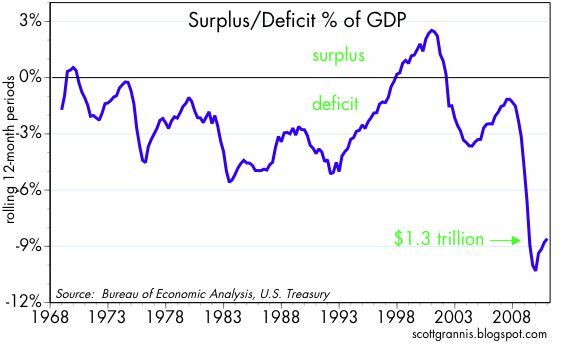 Deficits of 9% or more of GDP are a serious drag on the economy. 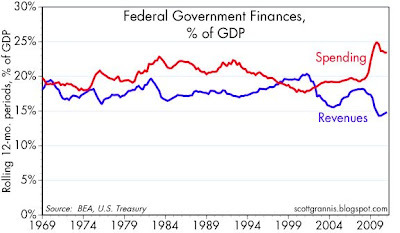 Government spending is the problem, more so than the deficit. When government spends money it does so much less efficiently than the private sector, thus squandering the economy's scarce resources. Contrary to popular (Keynesian) thinking, large deficits are not stimulative, they are contractionary. Reducing government spending would likely provide a big boost to the economy, since it would reduce the future expected burden of taxation and it would make the economy more efficient and productive. 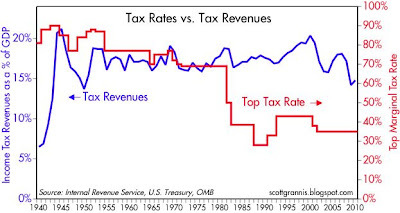 There is no necessary connection between tax rates and tax revenues. In this chart, we see that a huge reduction in top tax rates (from 90% prior to 1955, to 28% in the late 1980s) did not reduce tax revenues as a % of GDP at all. Lower rates coupled with fewer deductions and a broader tax base are far more efficient ways of collecting taxes. Reducing the top marginal rate for as many people as possible is the best way to use the tax code to encourage work, investment, and risk-taking. 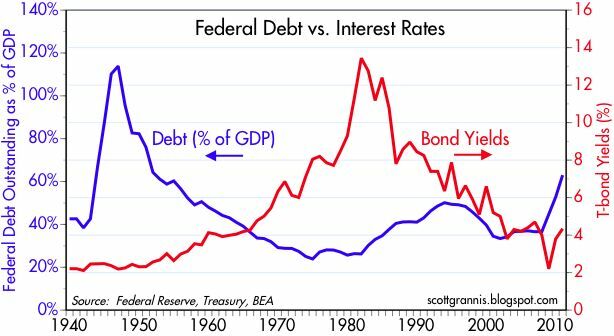 The level of federal debt has correlated negatively to interest rates for most of post-war history. Interest rates are primarily determined by the rate of inflation, which is the purview of the Fed. 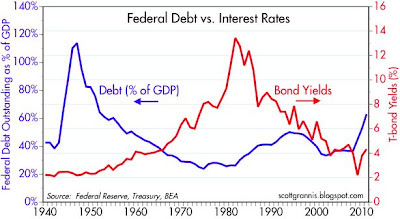 Only recently has the Fed been engaged in monetizing the federal deficit, and not coincidentally, there are signs that the level of debt and interest rates are more positively correlated now than at any time in the past. Should inflation rise, interest rates will likely follow, and the combination would make the debt burden much more serious than it already is. Part 1 (overview) of this series, which is taken from a recent presentation I made at UCLA, can be found here. Federal reserve monetary policy hasn't been this easy/accommodative since the inflationary 1970s. Short-term real borrowing costs are negative, a policy that is designed to erode the demand for money, expand the money supply, and push inflation higher. The Fed has exploded its balance sheet in order to accommodate an explosion of money demand. 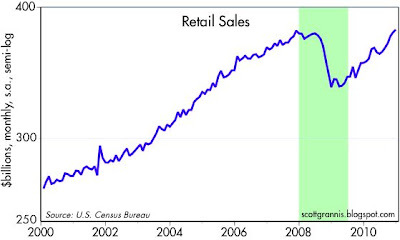 If the Fed hadn't done this then we probably would have suffered from a deep recession/deflation. 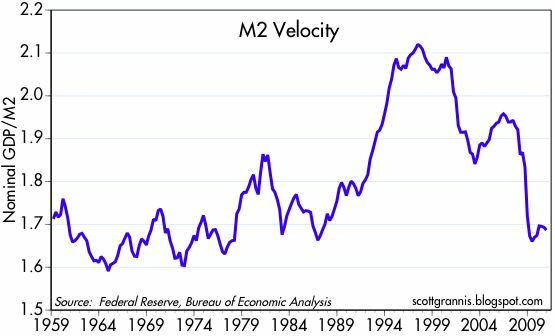 The velocity of M2 money is likely to rise as money demand falls and confidence returns, boosting nominal GDP. Velocity fell sharply a few years ago as confidence collapsed and money demand soared. Things are just beginning now to reverse. The growth rate of most measures of the money supply has averaged about 6% per year for many years. 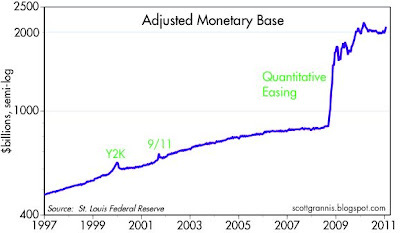 There is no obvious sign yet that the Fed's quantitative easing has had any impact on the growth of the money supply. Taken in isolation, this would suggest that the Fed's provision of reserves has been just enough to satisfy the market's demand for reserves and to accommodate a modestly growing economy. The dollar is very weak—about as weak as it has ever been—and this reflects very accommodative monetary policy and deep concerns about the future of the U.S. economy. 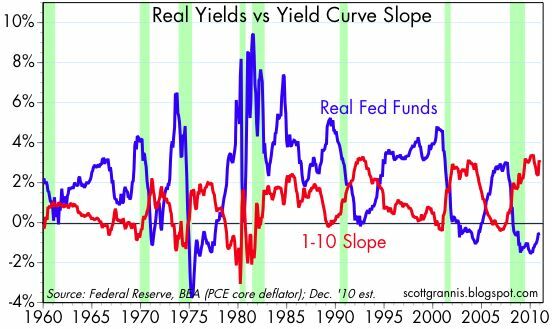 Low real yields from the Fed and a very steep yield curve all but guarantee a continued recovery. 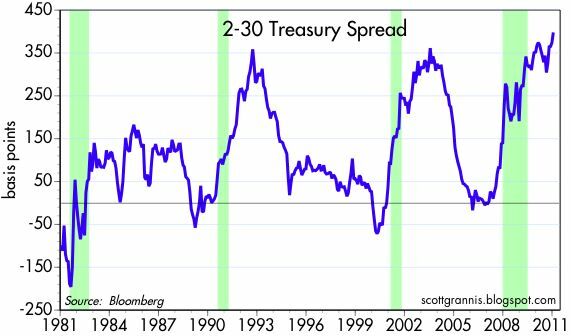 Every post-war recession has been preceded by high real yields (tight money) and a flat or inverted yield curve. Thanks to QE2, the fear of deflation has again all but disappeared. 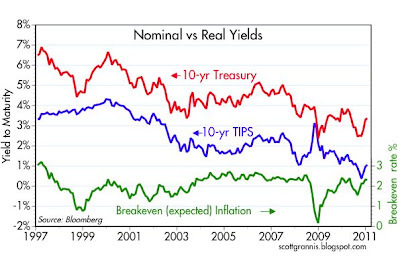 Inflation expectations now are close to the average of what we have seen in normal times. The rise in Treasury yields poses no immediate threat to the housing market. Mortgage rates are still very low from an historical perspective. The combination of very low borrowing costs, rising real incomes, and a 35% decline in the real, average cost of housing prices in recent years has left homes more affordable than at any time in more than a generation. This morning I spent some time with members of UCLA Anderson Prof. Bill Cockrum's Student Investment Fund. I believe this is the 5th or 6th year I have done this, and I always look forward to interacting with this group as they begin the difficult task each year of formulating an economic outlook and a coherent investment strategy. I thought it might be worthwhile to break down my presentation to them in several parts, with a minimum of words and a maximum of charts. Most of the charts and themes have been covered here in other posts, but I think it helps to put it all together in an illustrated, narrative form. Formulating an investment strategy first requires an understanding of what the market is expecting. If your view of the world is the same as the market's then you can't expect to do much better than just investing passively in the market. But if you think the market is misjudging things, then that opens up opportunities for gains by over- or under-weighting different market sectors and individual stocks or bonds. Many people use opinion polls or surveys of bullish and bearish sentiment to judge whether the market is cheap or rich. I think it's better to look at the market itself; I think there are a variety of market prices that provide good insight into the assumptions that are driving the market. The things I look at tell me that the market is still quite concerned about the future—there are lots of walls of worry, in other words. I think many of these concerns are too pessimistic, therefore I am generally optimistic and bullish. Monetary policy is a source of great concern, since the Fed is in uncharted waters. Three years, ago, if you had told just about any economist in the world that the Fed was about to purchase well over $1 trillion worth of securities in a relatively short time span, they would have reacted with forecasts of imminent hyperinflation, but only after protesting that such a scenario was virtually impossible in the first place. But it has happened, and nobody knows yet what the endgame is going to be. So far there hasn't been any overt inflation problem, but there is a lot of action in the gold and commodity markets that might be precursors to a general rise inflation. 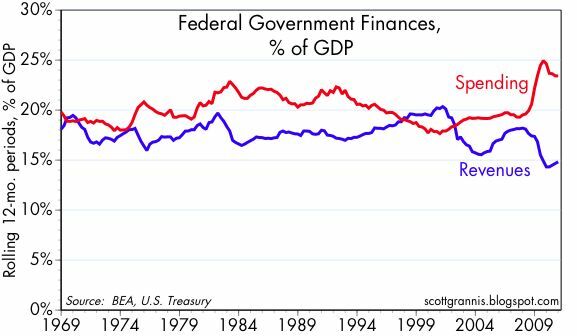 Fiscal policy is also a great source of concern, since federal spending relative to GDP has expanded by some 25% in just a few years, and will be as large or larger a share of the economy for the foreseeable future unless big changes are made. The problems with a surge in spending are many: higher spending, if left unchecked, sooner or later will require higher tax burdens, and higher expected tax burdens automatically depress the present value of all risky assets. Higher spending also means a weaker economy, since government spends money much less efficiently (and many times with wild abandon and rampant corruption) than the private sector. Credit spreads have narrowed a lot, but they are still well above the levels we might expect to see in times of a normal, healthy economy. The implied volatility of equity options (e.g., the VIX index) is still well above levels that we might expect to see during times of economic and financial tranquility. The dollar is as weak as it has ever been. Surely that reflects great concern on the part of US and global investors over the future of the US economy. Gold prices have soared to over $1300/oz. Surely that also reflects great concern over the political and financial future. Commodities are up strongly, across the board. This reflects not only a strong global economy but there appears to be a significant monetary component to rising commodity prices, as investors stock up on physical assets out of fear that money may lose its value. 10-yr Treasury yields of 3.4% only make sense if the market in aggregate holds a very dim view of the US economy's ability to grow. Given the widespread belief in the Phillips Curve, a very weak growth outlook for the US economy compels one to believe that inflation is going to be very low for a considerable period. 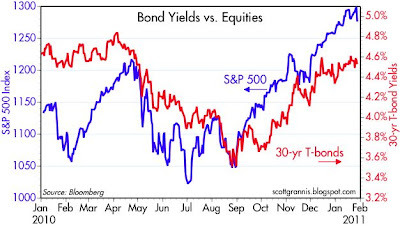 So Treasury yields are a clear sign that the market believes US growth will be sluggish for a very long time. 2-yr Treasury yields of 0.6% are an unambiguous sign that the market believes the Fed when it says that short-term interest rates will be very low for a very long time, and that will be the case only if the economy is weak for a long time. In short, the market is generally pessimistic about a lot of things, leading me to the conclusion that equities are attractively priced if one believes that the problems facing us are not insurmountable. The federal deficit is a big problem, but a solution is far from impossible. Just holding spending constant would balance the budget within 5 years. Social security is a big problem, but most of the problem could be addressed by raising the retirement age and indexing benefits by using the CPI instead of nominal wages. Healthcare is a big problem, but simply changing the tax code to allow everyone to deduct medical expenses would go a long way towards making the healthcare market more efficient and cost effective. The November '10 elections made it clear that the people are demanding big changes from Congress, with the number one message being "stop the spending." Given the extreme to which the situation has gone in so many areas, the time is ripe for some fundamental and positive changes in the direction of fiscal policy. The latest data from the Fed reveals only a modest uptick in the Monetary Base, the measure of that part of the total money supply that is completely controlled by the Fed (bank reserves plus currency in circulation). The uptick to date doesn't yet equal the size of the Fed's QE2 purchases, and the base today is only $40 billion higher than it was at this time last year. Other measures of the money supply (M1, M2) tell a similar story: there has been no unusual growth in the amount of money in the economy. 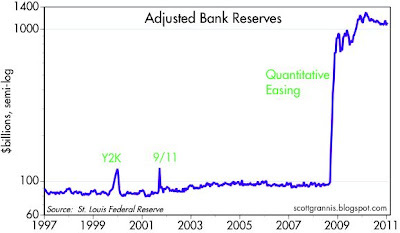 This means that a) a good portion of the Fed's QE2 purchases to date have only served to offset other factors that have subtracted reserves, and b) the extra reserves created by the Fed's QE2 purchases of Treasuries are for the most part still being held voluntarily by banks (i.e., the financial system is still risk-averse enough to want to accumulate safe assets like reserves that pay only 0.25% annual interest). In short, QE2 has not resulted in a flood of new money, but instead has served mainly to satisfy the world's demand for safe haven assets. It's also the case that one of the stated reasons for doing QE2—to reduce long-term interest rates in order to boost the economy—has at best a mixed record. 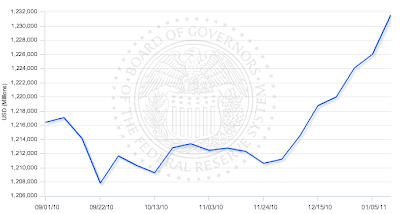 Treasury bond yields are up sharply since late August when the idea of QE2 was first floated. 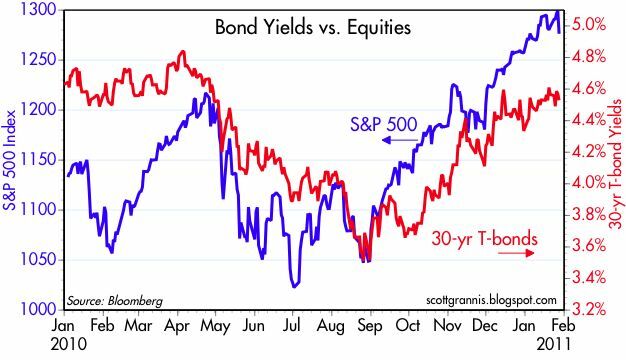 Yet despite higher bond yields, the economy has picked up and the equity market has enjoyed a substantial rally. If QE2 hasn't resulted in any new money flows to the economy, and Treasury bond yields are sharply higher, can QE2 still be given credit for somehow stimulating the economy? Perhaps it deserves some credit, if only because it has all but erased investors' fears of deflation, and any reduction of uncertainty improves confidence and that in turn leads to more investment and risk-taking. But perhaps the economy was improving on its own by the time QE2 got underway. Stay tuned as we continue to monitor these important monetary developments. ... manufacturers and retailers underestimated consumer demand and ran down inventories dramatically in the fourth quarter. Anecdotal reports suggest that low inventory levels are having a cost in the form of lost sales. Moreover, prices are not likely to be slashed to reduce excess inventories after the holidays. 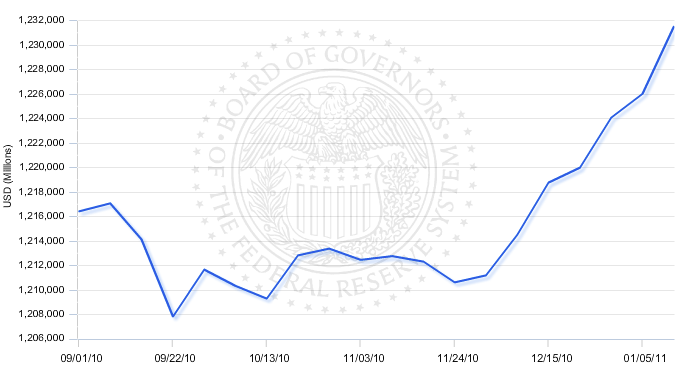 What this means is that there is more room for production increases in 2011 and inflation will continue to move higher. It is quite likely that businesses are already attempting to rebuild their inventories, but even if they manage to hold them steady, that will have the effect of boosting first quarter growth. I recall quite a few times in the past where a weak GDP number caused by inventories was followed by a stronger number in the subsequent period. It's likely to happen again. I needed a 4% Q4 print to make my Dec. '09 prediction of at least 3% growth in 2010 be correct. If the first estimate stands, then I will have overestimated growth by 0.2%. Not too bad, but it was my optimism on the economy's growth prospects that led me to mistakenly expect the Fed to begin tightening policy last year, and to expect bond yields to be higher than they turned out to be. But just because I overestimated growth last year does not mean I need to cut my growth expectations (at least 4%) for this year. Stronger growth is likely because confidence is up, uncertainty is down (e.g., the tax cut extension passed), global growth remains very strong (e.g., China and India), fiscal policy headwinds are slowing (e.g., no more wasteful stimulus experiments), and monetary policy remains very accommodative. 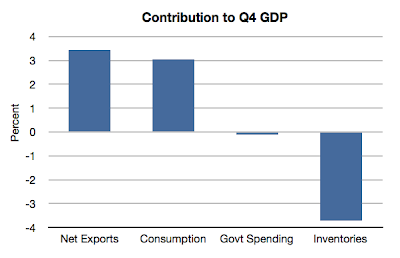 Another thing I did not expect was the very small rise in the Q4 GDP deflator (0.26% annualized), which contributed to a very small rise in the nominal growth of Q4 GDP: 3.44%. 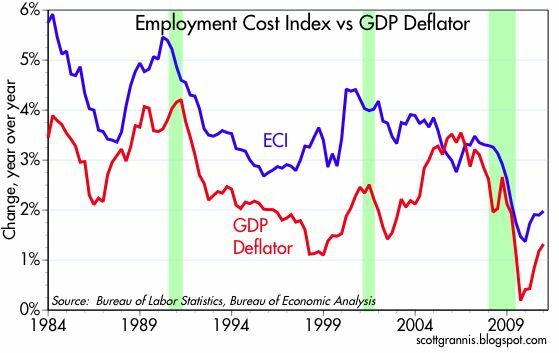 The very small gain in the deflator last quarter could be just a one-time event, since as the chart above shows, on a year over year basis both the deflator and the Employment Cost Index look to have bottomed. Regardless, relatively slow growth in nominal GDP, alongside somewhat faster growth in M2 in the fourth quarter, resulted in a modest decline in M2 velocity (see chart below), whereas I had been expecting a pickup. But again, that is not a reason to get bearish on 2010. 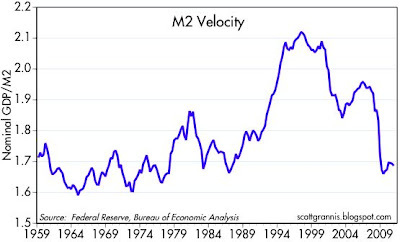 It still makes sense for velocity to pick up (confidence is improving, and the dollar is weak, which suggests that money demand is declining on the margin even as the Fed remains very accommodative), and it is also the case that M2 growth appears to be accelerating a bit. The above chart plots the daily ratio of the S&P 500 index to the spot gold price. Stocks have been doing pretty well in nominal terms, with the S&P now up 92% from its Mar. '09 low. But against gold, stocks are up only 36% from last year's low. The thing that caught my eye is that since the end of last November, stocks are up 10% while gold is down 5%. Gold is down almost 8% (almost $110/oz) since its early December high. Stocks may be on the verge of a significant upswing against gold, after losing 87% of their value from the highs of 2000 through Mar. '09, as shown in the next chart. 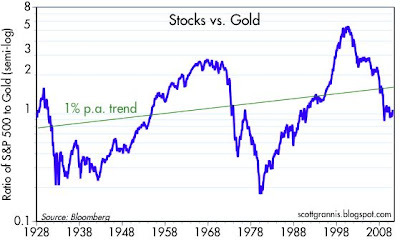 Taking a very long-term perspective and ignoring the impact of dividends, stock prices have only just kept pace with gold prices over the past 83 years. This fact lends credence to those who advocate a gold standard, since it shows that gold indeed holds its value against other real assets over long periods, though of course there have been huge swings from time to time. But if the best that gold can do over time is to match the increase in stock prices, while delivering enormous extra volatility along the way, then gold is not a particularly attractive asset from an investment perspective, especially since it pays not a penny of income and in fact costs money to store. And it's particularly unattractive today, unless you are convinced that the Fed is on the verge of committing a major monetary mistake and/or the U.S. is going to default on its debt obligations. What are the drivers behind this recent development? That's anybody's guess, of course, but here's mine. Borrowing from observations made by my friend Don Luskin, I think the recent rise in stocks and the decline in gold reflect an emerging sense of optimism regarding the economy. The economy is doing better than expected, and it's not just because the Fed is buying Treasuries by the bushel. 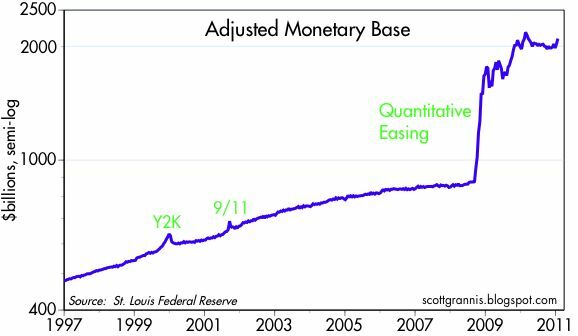 As I've noted before, it's hard to find evidence that the Fed's QE2 purchases have resulted in any expansion of the money supply; indeed, it looks like they have only managed to keep the monetary base from shrinking. In any event, with the economy doing better, the need for a QE3 definitely declines, and that in turn means less risk of a possible Fed inflation error, plus less risk of some significant, adverse geopolitical or financial crisis. So the case for buying gold at prices that are quite high on both a nominal and real basis is diminished. 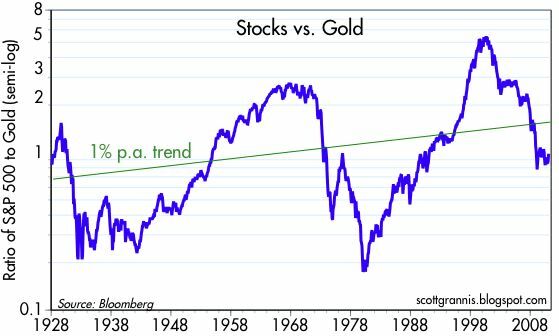 Consider also that the long-term trends in stocks vs. gold prices reflect major shifts in the relative attractiveness of financial vs. real assets. That relationship, in turn, is heavily influenced by monetary, fiscal, and political trends. Stocks collapsed against gold in the 1970s, because the U.S. devalued the dollar, the Fed was way too easy, and presidential leadership (Nixon, Ford, Carter) was weak. Stocks then surged against gold from the early 80s to 2000, because the Fed was tight, inflation collapsed, taxes were reduced by an order of magnitude, and presidential leadership was generally good (Reagan, Clinton). Stocks have been crushed since 2001, as the Fed began pursuing a very accommodative monetary policy, government meddling in the housing and financial markets led to a huge housing boom and bust, and presidential leadership has been at best controversial and less than inspiring. It may not be obvious yet, and I may be jumping the gun, but I think it's worth suggesting that we may be on the cusp of a new era, characterized by improving fiscal policy (e.g., a reduction in the size of government and reduced tax burdens), a return to more prudent and/or rules-based monetary policy, and better presidential leadership. 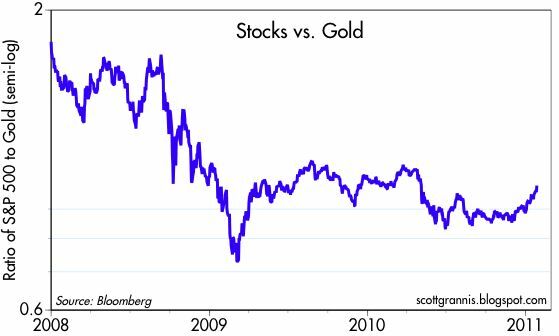 We've already seen financial assets recover a good deal of what they lost in nominal terms in the past three years, but stocks could still gain significantly relative to gold. 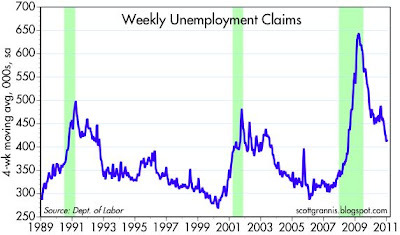 Weekly claims for unemployment last week rose 50K more than expected, but I don't think that is a concern. Before seasonal adjustment, claims actually fell by 68K, so what this means is that claims didn't fall by as much as the seasonal factors expected. That's the flip side of what was happening near the end of last year, when claims weren't rising as much as expected. 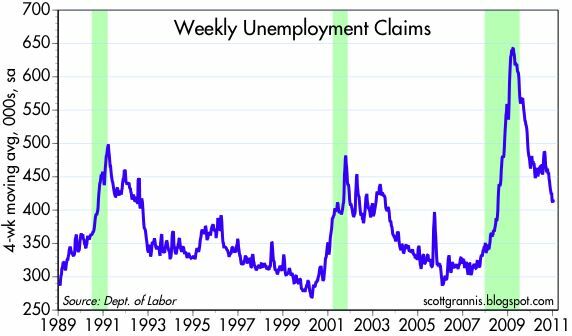 Now the dust is settling, and the picture that emerges is one in which unemployment claims have definitely moved lower, but not hugely. It's still a sluggish labor market, but the outlook is gradually improving. 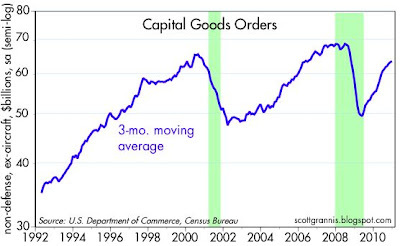 Once again, new orders for Capital Goods—i.e., business investment—exceeded expectations. December orders were up 1.4% (vs. an expected 1.3%), on top of upward revisions to the data for the previous two months. Over the course of last year, business investment has increased by 15.5%, a staggering figure. If any part of this recovery can be termed "V-shaped," this is it. Strong gains in business investment reflect the return of confidence to the business sector, while at the same time laying the groundwork for future gains in productivity. From a taxpayer's perspective, Obama's biggest weakness is his lack of understanding of how the economy really works. That weakness has already cost us $1 trillion, and what he said in his SOTU speech last night shows that this was a lot of money down the drain, because he learned very little from his failures these past two years. He continues to believe that enlightened politicians can boost economic growth much like a good coach can whip a team or a star player into shape. Last night's SOTU peech was Coach Obama's pep talk before the big game. Problem is, he still doesn't understand the game of economic growth, so there is little chance that his coaching will prove effective. If he learned anything in the past two years, it was that the public doesn't like the concept of stimulus spending, and it doesn't like a lot of new government programs. Solution? Call the stimulus spending something else, and don't say it's government that is taking over healthcare, energy research, high-speed rail and education, just say it's all about investments that will make our economy stronger. That may sound great to other liberals, but to those working in the trenches it's just more spending, more regulations, and more suffocating government presence. Competitiveness comes from the bottom up, not from the top down: from entrepreneurs, inventors, risk-takers, and just about anyone who is willing to work and wants to improve his standard of living. Policymakers' ability to influence things is limited to setting the ground rules that in turn maximize the private sector's growth incentives. The chances are slim that Coach Obama can direct tens and hundreds of billions of dollars to the companies and industries that are going to revolutionize the future; there are millions of people at work all over the world trying to do this already, and there is no shortage of capital ready and willing to finance economically viable projects. If Obama really understood the economy, he would have showed much more interest in cutting spending. Proposing to freeze discretionary spending while also proposing to spend a whole lot on "investments" is not going to avoid the fiscal train wreck we are headed for, and it's not going to help the economy. Federal spending has increased hugely under his watch, and is scheduled to absorb an unprecedented amount of the economy's resources in the future. This is sapping the economy's strength by allowing inefficient government programs and bureaucrats to waste the economy's scarce resources. Cutting spending now is the best way to strengthen the economy, since it returns money to the private sector where all true growth originates. Cutting spending also reduces expected future tax burdens, which in turn encourages more investment and work effort. About the only thing Obama proposed that would actually enhance the competitiveness of the economy is a reduction in corporate tax rates, in exchange for the elimination of loopholes and deductions. A lower tax rate applied to a broader tax base is bound to strengthen the economy, since it increases the rewards on the margin to new investment, and it removes distortions which lead to inefficient investment decisions. Higher after-tax returns should result in more investment, and more investment means more productivity and more jobs. Since our head coach is almost clueless, should we be worried about the ability of the U.S. economy to win? Fortunately, Obama is not going to be calling many of the plays. He's lost the ability to ram things through Congress, and the Republicans are tightly focused on doing the right thing (e.g., cutting spending and reducing tax and regulatory burdens). At the worst we will suffer from gridlock, but that's much better than suffering from an even more burdensome government. At best, the Republicans will convince some Democrats to move in a more sensible direction (e.g., dismantling ObamaCare, cutting farm subsidies, scrapping the ethanol program, cutting corporate taxes) and Obama may find himself forced to go along. Obama has also lost a lot of his authority, because so much of his agenda has proved misguided, and his popularity and power of persuasion consequently have suffered. Lacking authority, vision, and a coherent plan for the future, Obama's SOTU was a big disappointment. Nevertheless, it has expanded the political vacuum that exists in Washington, and politicians likely will scramble to fill it, and that is not a bad thing at all. There are plenty of politicians of the Tea Party variety that understand what needs to be done, and the public has already voiced its approval via last November's elections. I think we have a lot of positive fiscal policy developments to look forward to, and that is an important source for my continuing optimism. 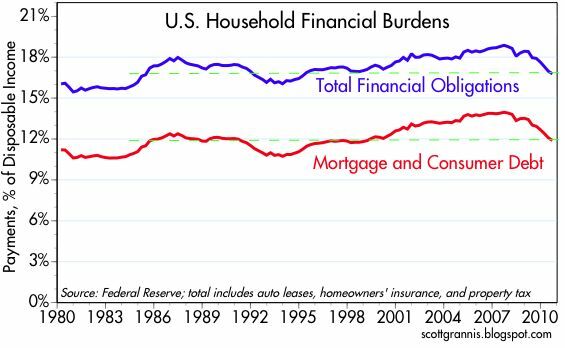 Many argue that too much debt on the part of U.S. households was one of the contributing factors to the 2008-09 recession. Whether that's true or not, households have managed to deleverage impressively since late 2007. 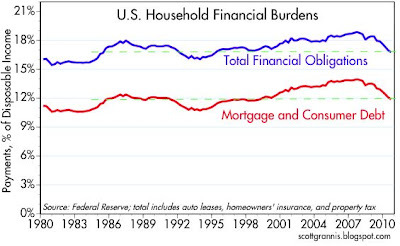 Total financial burdens (monthly payments on mortgages, consumer debt, auto leases, homeowner's insurance, and property tax, as a % of disposable income) dropped 11% in the three years ended last September, and mortgage and consumer debt burdens dropped by almost 15%. By these measures, financial burdens are now close to their average of the past 25 years. Mortgage defaults undoubtedly have contributed to the deleveraging process, but so has a lot of refinancing of existing mortgages—many millions of households now enjoy paying the lowest mortgage interest rates in many generations. According to Merrill Lynch data, the average rate on all existing mortgages dropped by half a percentage point from Sep. '07 to 5.1% in Dec. '10. Regardless of how the deleveraging occurred, household finances on average are in much better shape today than they were three years ago. I also note that deleveraging has proceeded at a fairly rapid pace even as the economy has been recovering. This underscores the point I've made repeatedly that leverage does not create growth—it merely transfers demand from one person (the lender) to another (the borrower). According to the two indices of real estate prices in this chart, both residential and commercial estate prices have been roughly stable for more than one year, after having suffered brutal declines of 30% and 40%, respectively. 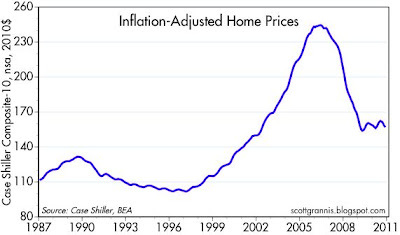 While many observers are extrapolating the marginal weakness displayed in the Case Shiller-20 index (shown above) in recent months, and calling for a second wave of price declines, I offer the following chart, which is a subset of the index above, and which reflects prices in the 10 largest metropolitan areas. Despite the fact that this chart is also adjusted for inflation, the trend since early last year or so is flat, if not slightly rising. 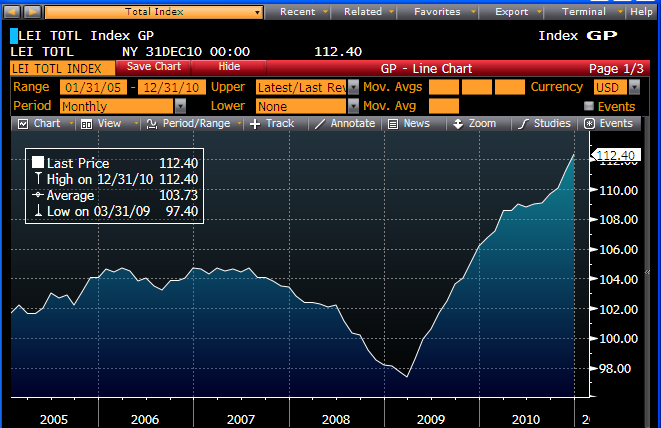 The nominal value of this index is now almost 5% above its April '09 low. The real estate market is always one in which local conditions can predominate, and the fact that one's selection of markets can paint two different pictures suggests that on balance it's likely that not much is going on. 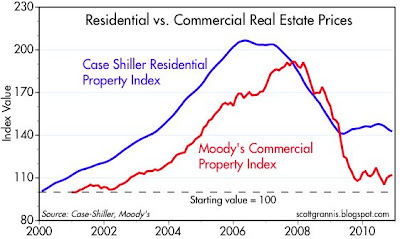 I continue to believe that the correction in the real estate market has run its course. It's been 5 years since the peak, which is plenty of time for the market to adjust to new realities. Residential construction has plunged by 75%, leaving new home construction far below the level necessary to keep pace with new household formation, and thus effectively taking a lot of excess housing inventory off the market. Borrowing costs have also plunged, and real personal incomes have risen, raising housing affordability to levels not seen in decades (chart below). An index of homebuilders' stocks is up 150% from its late-2008 lows, and lumber prices have more than doubled since March '09, both of which point to a nascent recovery in the construction market's fundamentals. Finally, I note that the economy is clearly improving, and household net worth has risen significantly in the past two years. There may well be a significant increase in the number of foreclosed properties being brought to market this year, but there is a price that will clear any market. Whether it will take significantly lower prices for the market to clear this year is the key question. I doubt it, but those who are skeptical of the economy's ability to grow believe that real estate prices will need to fall by enough to cause new concerns about the health of the banking sector and new concerns about household net worth. Only time will tell, but I think the preponderance of evidence continues to suggest that the worst has passed, and optimism makes more sense than pessimism. Late last year I highlighted a variety of charts that painted a picture of "impressive economic strength." In this post I revisit one that has displayed some impressive follow-through: Commercial & Industrial Loans, a good measure of bank lending to small and medium-sized businesses. The top chart shows the past 5 years' worth of data, while the bottom chart zooms in on the past several months (both are seasonally adjusted by the Fed). The message is very clear: bank lending to businesses has bottomed, and is now rising at a fairly impressive rate. This marks a very important change in financial conditions in recent months: after two years of a sharp decline, bank lending is up at a 13.6% annualized rate since Nov. 24th. Unfortunately, we can't know whether the recent strength in new lending reflects an easing of bank credit standards or a new-found desire on the part of businesses to borrow (or stop deleveraging), or both, but it's likely a combination of the two. In either case, however, it reflects increased confidence on the part of banks and small businesses, and that is something that has been sorely lacking in this recovery. The rise in new lending may also reflect an emerging decline in the demand for money (borrowing money is equivalent to being "short" money, or wanting less of it), and that could mean the Fed's QE2 program is gaining traction. The Fed's massive expansion of bank reserves has not yet resulted in any meaningful expansion of the money supply, as I noted yesterday, since banks have been content to let their extra reserves sit idle at the Fed, but this may now be changing, if C&I loans are any guide. Nothing is out of control yet, of course, but if there has indeed been a real decline in the economy's demand for money, then this, coupled with increased business confidence, would point to a meaningful increase in nominal GDP growth in coming months. That nominal increase would likely be comprised of a pickup in inflation as well as a pickup in the pace of real growth. Eurozone industrial activity increased at a very healthy pace in November, with industrial orders up 2.1%. 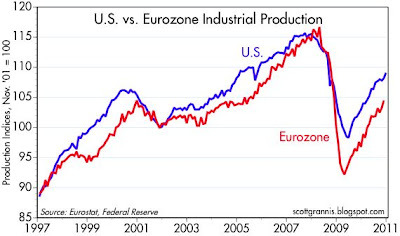 As this chart shows, Eurozone industrial production was up 1.2%, and it has risen 7.3% for the past year. 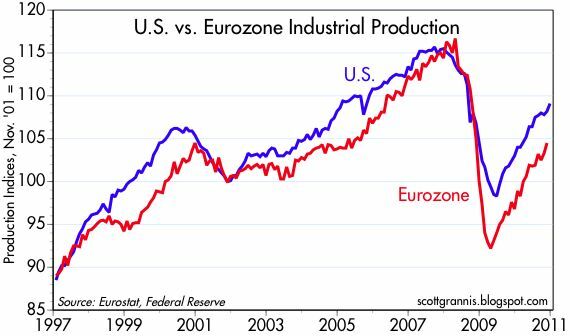 As EconomPic notes, the relatively strong rebound we have seen in Europe and in the U.S. is still in the nature of a recovery from the catastrophic 2008 slump—production is still well below prior highs. But it is an impressive recovery nonetheless, especially since two years ago hardly anyone expected the global economy to be as strong as it is today. This first chart shows the level of M2, arguably the best measure of the amount of "money" in the economy (M2 consists of checking accounts, currency in circulation, retail money market funds, small time deposits, and savings deposits). The y-axis uses a semi-log scale, so that a constant slope equates to a constant rate of growth, which in this case appears to be about 6% per year, compounded. 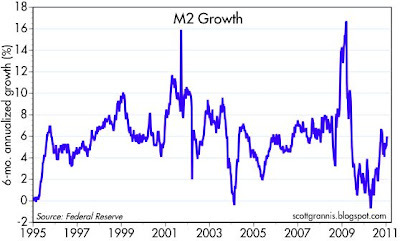 There are times when M2 grows faster or slower, but on average it has increased about 6% per year, which not coincidentally is only about 1% per year faster than the average annual growth rate of nominal GDP over the past 25 years. A good portion of that faster-than-nominal-GDP growth can be explained by the huge amount of U.S. dollars that are now held by foreigners. When money grows in concert with growth in the nominal value of transactions in the economy, it's hard to worry that inflation is going to rise because there is "too much money chasing too few goods and services." 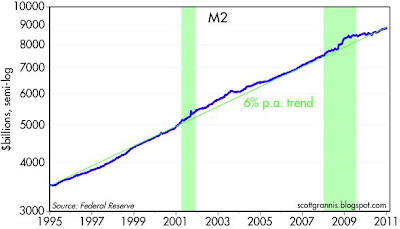 What about those periods during which M2 has grown much faster than 6% a year (i.e., 2001-5 and 2008-9)? The second chart explains what has happened. 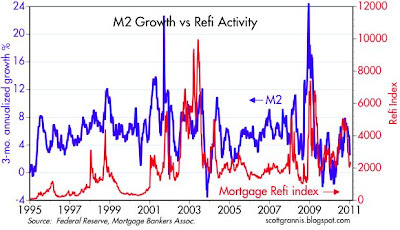 There is a strong correlation between big increases/decreases in refinancing activity and faster/slower growth of M2. That's because the refinancing process temporarily creates a lot of extra "money" as money flows into and sits in escrow accounts. 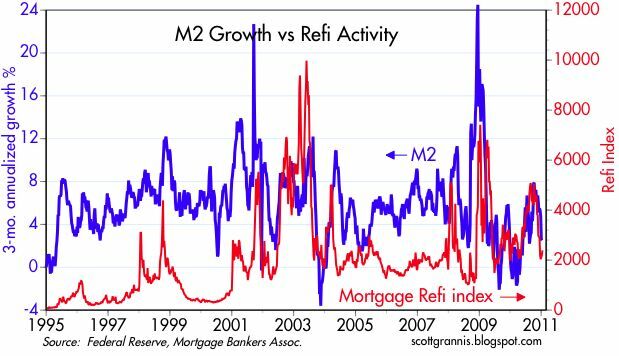 Most recently, M2 growth has slowed sharply (the result of rising interest rates since last summer), just as refinancing activity has dropped rather rapidly. The recent slow growth in M2 (2.5% annualized growth over the past three months) is nothing to worry about, because it is most likely the natural result of a decline in mortgage refi activity. 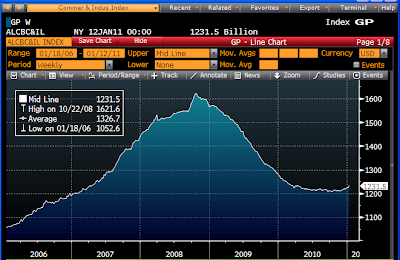 We see a similar story—not much of note going on with the money supply of late—in this chart of bank reserves. As of early January, there is no evidence that the Fed's QE2 program has resulted in any unusual increase in bank reserves, the raw material for any expansion of the money supply. 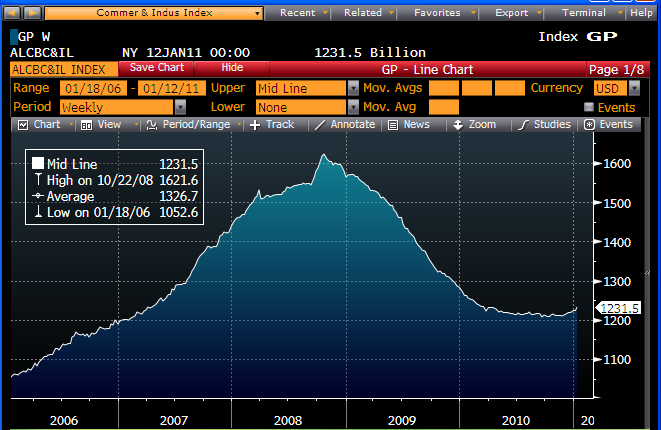 In fact, bank reserves today are almost exactly the same as they were at this time last year ($1.1 trillion). Apparently, the Fed's additional purchases of Treasuries in recent months have mostly been offset by other actions which have drained reserves. It may be hard to believe, but to date, there is no evidence to be found in the money supply statistics that the Fed's addition of over $1 trillion of reserves to the banking system since Sep. '08 (an 11-fold increase!) has resulted in any unusual increase in the amount of money sloshing around the economy. What we do observe, however, is that the value of the dollar has declined relative to other currencies, and the dollar buys a lot less gold and commodities (e.g., since Sep. '08 gold is up over 60%, and spot commodities are up 30%). This suggests that there has been an effective increase in the amount of dollars in the system relative to the demand for dollars. It is an excess of dollars in relative terms that is likely responsible for the lower value of the dollar and the higher prices of commodities. 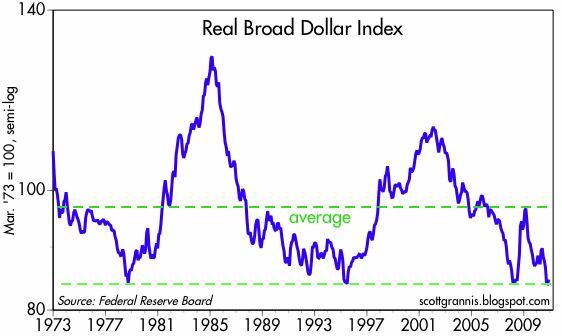 With the Fed holding the amount of bank reserves relatively constant, but at a level that is orders of magnitude higher than we what we observe during "normal" times, the key thing to watch is the demand for dollars, since that is the thing that can change on the margin. If the world wants fewer dollars, then the existing supply of dollars will be "un-hoarded," and banks will want to reduce their holdings of reserves, by using those reserves to support an increase in lending. The result of weaker money demand and more bank lending likely would be faster nominal GDP growth. I think this process is underway. It's still difficult to see with clarity, but a careful reading of the monetary tea leaves tells us that the economy is "reflating" as we speak—the size of the economy is growing, and the volume of transactions in on the rise. Today the spread between 2- and 30-yr Treasuries reached a new all-time high of 398 bps. This is an unequivocal indication that the Fed's effective policy stance is ultra-accommodative. The yield curve almost always steepens a lot coming out of recessions, because the Fed typically shifts to easing mode as the economy enters a recession, and then reaches full-bore easing in an attempt to help the economy dig out of its recession hole. 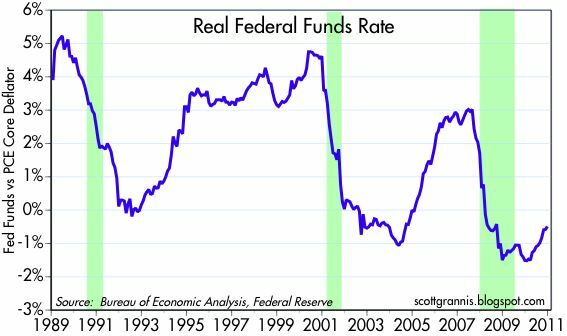 This cycle has been no different from many others, with the main difference being that the funds rate has never been at or close to zero before. A very steep yield curve such as we have today is also the direct result of the bond market's expectation that short-term interest rates will not remain at or near zero forever—starting sometime around the end of this year, the market expects the Fed to begin hiking rates, reaching 4% within 5 years' time. That too is typical as business cycles mature. 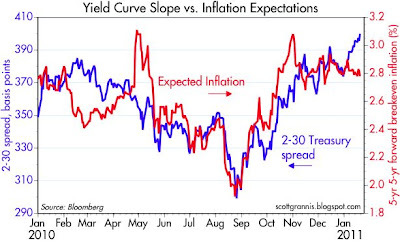 And as the top chart suggests, a steepening of the yield curve is also strongly indicative of rising inflation expectations. 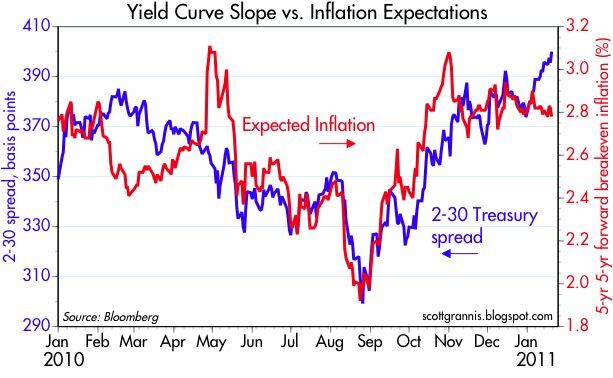 The only mystery about recent market action this year is the failure of 5-yr, 5-yr forward inflation expectations to rise in line with the ongoing steepening of the curve. It may be the case that intermediate TIPS breakeven spreads are being distorted by the Fed's ongoing Treasury purchases. Higher inflation expectations over the next 5 years would require higher nominal yields—but those are being held down by Fed purchases—and/or lower TIPS yields—but those are already negative out to 5 years. The path of least resistance for now would appear to be a further decline of short-term TIPS yields into negative territory (i.e., a further increase in the prices of short-maturity TIPS), a prospect that nevertheless must be daunting for many investors to contemplate. But with the ongoing rise in commodity prices, investors may eventually conclude that accepting a negative real yield is the price one must pay for inflation protection. 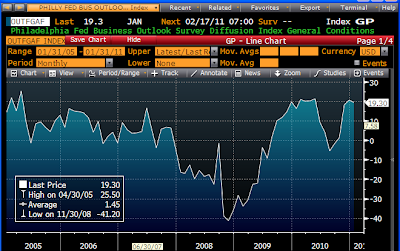 The December Leading Indicator (above) rose much more than expected (+1.0% vs. +0.6%). It has been rising steadily, and at a healthy clip, ever since March 2009, with the exception of a flattish period from Mar-Aug of this year. 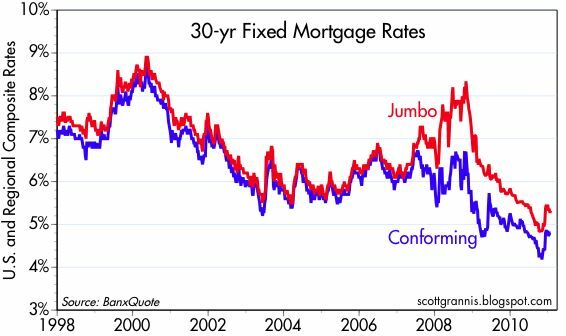 That period included the Euro sovereign debt default scare, the US economy's "soft patch," and an apparent slowdown in the housing market. Those problems are now in the past, and fiscal policy is now pointed in a much more optimistic direction, leaving open the strong possibility, in my view, that we could see an acceleration in U.S. economic growth this year. Weekly unemployment claims jumped unexpectedly last week, but settled back down this week, leaving us with a significant and convincing decline in the 4-week moving average over the past several months. The labor market is definitely improving. As an anecdotal aside, my cousin landed a decent, full-time job yesterday after a relentless, at-times-heartbreaking, two-year search. 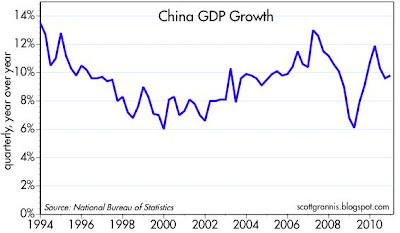 China's economy grew about 10% last year. For years, it seems, markets have been on tenterhooks over the possibility that China's economic growth bubble might burst, bringing the rest of the global economy down with it. Yet the Chinese growth engine just keeps on chugging. It's amazing what can happen when a government unleashes market forces in an economy that was formerly highly regulated and suppressed. The minor amount of "tightening" that has been applied by the central bank in recent months is unlikely to make much of a difference here, since at best it offsets the dollar's weakness (which in turn is a function of the Fed's quantitative easing). 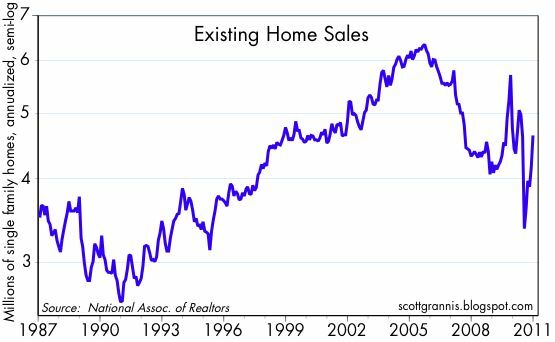 Existing home sales surged 12.3% in December, and have rebounded hugely from last summer's terrifying (at the time) weakness. The lion's share of the volatility in home resales in recent years can be attributed to government incentive programs which have come and gone. That's apparent when you consider that the average level of existing home sales over the past three years is unchanged from what it was in early 2008. Meanwhile, the inventory of unsold homes has fallen by 20%, from 4.5 million in mid-2008 to 3.5 million. These are not scary numbers at all, and are fully consistent with a market that has found a new equilibrium. The January Philly Fed business outlook survey was a tiny bit lower than expected (19.3 vs. 20.8), but remains at a healthy level, providing further confirmation that the "soft patch" that troubled market participants last summer was just temporary. This chart illustrates some enduring truths about monetary policy, Treasury yields, and the health of the economy, so it's worth revisiting from time to time. Right now it's sending a strong message: monetary policy is very accommodative, and poses virtually no risk to the economy. This unfortunately undermines at least some of the rationale behind the Fed's quantitative easing strategy (i.e., the economy needs help). Moreover, it also suggests that easy money today could be setting us up for rising inflation tomorrow, and that in turn could lead to another round of monetary tightening and the recession that would likely follow—though it could take several years for the unpleasant implications of this chart to surface. The blue line represents the real Federal funds rate, using the PCE Core deflator as a measure of inflation (that being also the Fed's preferred inflation measure). The real funds rate is arguably the best measure of how "tight" or "loose" monetary policy is: a high real rate discourages borrowing by making it very expensive, while a low real rate encourages borrowing by making it cheap. When borrowing becomes intolerably expensive, the public's demand for money rises (rising money demand being the opposite of rising demand for borrowed money), and eventually collides with the Fed's efforts to make money scarce (by tightening monetary conditions). An effective shortage of money thus develops that typically results in a recession. Based on this chart, one could argue that every post-war recession was caused by tight money. And in almost every case of very tight money, there was also a pronounced rise in inflation which created the need for monetary tightening. The late 1990s was the notable exception, since the Fed tightened aggressively even though the PCE Core rate of inflation never exceeded 2% from mid-1997 through mid-2001, gold and commodity prices fell, and the dollar rose. The red line reflects the difference between the yield on 10-yr Treasuries and the yield on 1-yr Treasuries, what's known as the slope of the yield curve. Bond market math tells us that the yield on 10-yr Treasuries is the market's best guess as to the average of the Federal funds rate over the next 10 years. Investors in aggregate are necessarily ambivalent between keeping money in cash for the next 10 years or buying a 10-yr Treasury bond today—both strategies are expected to yield the same total return over time, because a steep yield curve means that the market expects the yield on cash to rise over time as the Fed tightens policy. 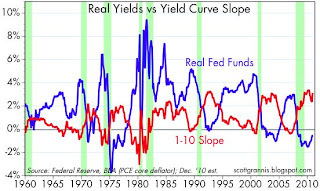 The fact that the red and blue lines move inversely most of the time confirms that the slope of the yield curve is a good indicator of how easy or how tight monetary policy is. When the Fed is very easy, the yield curve is usually very steep, because the bond market anticipates that the Fed will eventually have to raise rates significantly. Similarly, when the Fed is very tight, the yield curve becomes either flat or inverted, which is the bond market's way of saying that tight money today will be followed by easier money tomorrow. In short, monetary policy can't remain at extremes of tightness or looseness forever, and the slope of the yield curve is the bond market's way of saying how obviously easy or tight monetary policy is at any point in time. So, when the blue line is very high (i.e., when the Fed is very tight) and the red line is very low (i.e., when the yield curve is flat or inverted) that almost always signals a recession ahead, because it means that money is becoming exceedingly scarce. Conversely, as is the case today, a low red line and a high blue line are typically indicators of a business cycle that is still in its early stages, and money is in relatively abundant supply. The unusually weak level of the dollar today confirms that dollars are relatively plentiful, and the high level of gold and commodity prices says the same thing. The bad news here is that the Fed is likely repeating the errors of the 1970s, when monetary policy was on a roller-coaster ride and money was at times very cheap. Very cheap money in the 1970s helped fuel inflation, and today's cheap money is likely to do the same. The good news is that deflation risk is non-existent; the economy is not starved for money; and there is every reason to expect the economy to continue to expand for the foreseeable future. Plus, there is still time for the Fed to reverse course before inflation becomes too high or too ingrained. 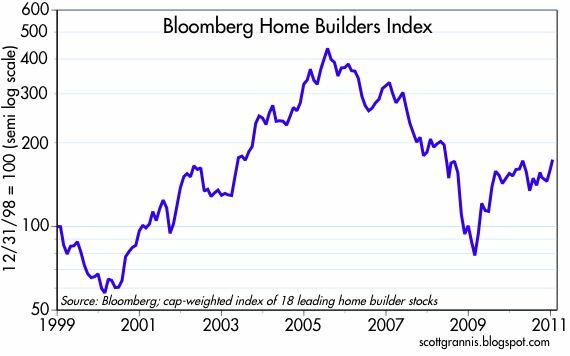 The Bloomberg index of major home builders' stocks is once again at a post-recession high, up almost 150% from its March 2009 low. That low occurred right around the time that home prices, according to the Case Shiller index, hit bottom (considering the 2-3 mo. lag built into the Case Shiller index). 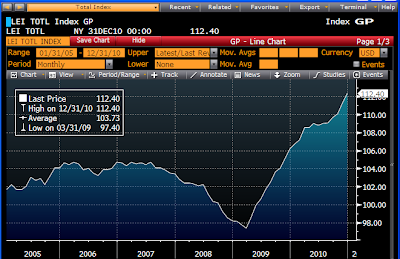 I also note that the home builders' index peaked in mid-2005, about 6 months before home prices peaked. Today, many are arguing that home prices are set up to decline to new low levels—given an expected surge in foreclosed homes being dumped on the market—but equity investors are either ignoring that news or (more likely) seeing signs of improvement in the housing market. Since housing starts have been basically flat and at very low levels for almost two years, I think the picture that emerges is one in which the coming supply of foreclosed homes is effectively offset by the combination of a multi-year dearth of new construction and the ongoing increase in new household formations. In short, after a wrenching 5-yr period of adjustment, the housing market has found a new equilibrium, and the equity market is "looking across the valley" of bad news to an impending recovery in home prices. 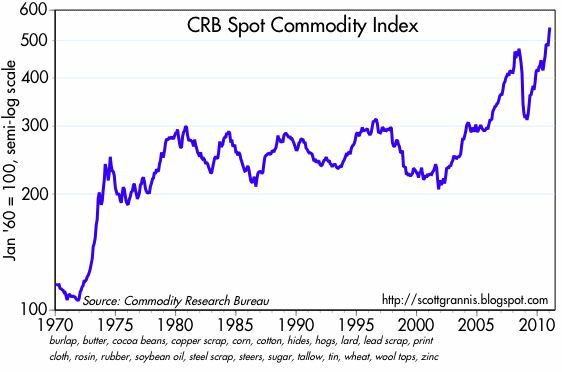 This index of commodity prices contains a decent amount of crude oil and products, in addition to a variety of other industrial commodities. Since crude prices are still about one-third less than their mid-2008 highs, it is remarkable that this index is now at a new all-time high. That is a testament to the pervasiveness with which commodity prices have risen across the board. 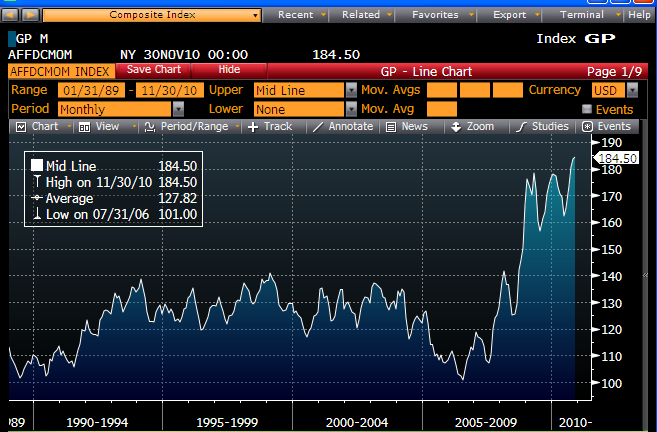 Note that 100 on the chart marks the mid-Nov. '01 low for most commodities. And recall that over the course of 2001, the Fed dropped its funds rate target from 6% to 1.75%—a substantial easing move that was exceeded in magnitude only in 1982 and 2008. Easy money—which has been with us for most of the past 9 years—provided the spark which subsequently drove commodity prices to a 200% gain. 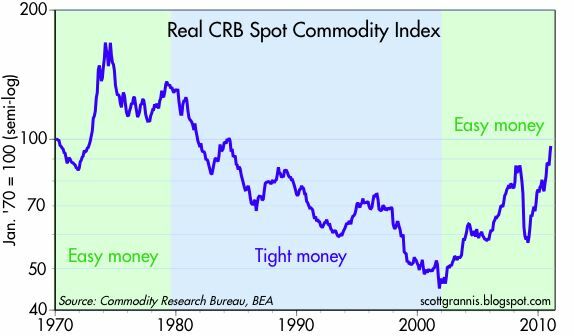 As commodity prices continue to explore new high ground, I thought it appropriate to dig a bit deeper into the relationship between commodity prices and monetary policy. I've argued for a long time that rising commodity prices are a good sign of both economic growth and accommodative (e.g., inflationary) monetary policy, but I've never tried to say just which was the dominant factor. It may be a waste of time, but supply-siders like me simply can't shake our deeply held conviction that sensitive market prices are valuable and leading indicators of what's going on with monetary and fiscal policy—much better than official measures such as the CPI and GDP. The Spot Market Price Index is a measure of price movements of 22 sensitive basic commodities whose markets are presumed to be among the first to be influenced by changes in economic conditions. As such, it serves as one early indication of impending changes in business activity. The commodities used are in most cases either raw materials or products close to the initial production stage which, as a result of daily trading in fairly large volume of standardization qualities, are particularly sensitive to factors affecting current and future economic forces and conditions. Highly fabricated commodities are not included for two reasons: (1) they embody relatively large fixed costs which fact causes them to react less quickly to changes in market conditions; and (2) they are less important as price determinants than the more basic commodities which are used throughout the producing economy. 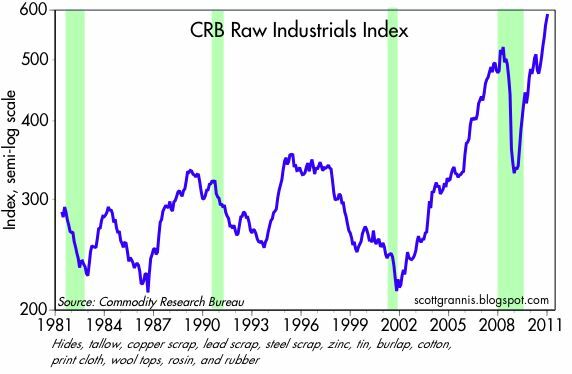 The commodities included in the index are burlap, butter, cocoa beans, copper scrap, corn, cotton, hides, hogs, lard, lead scrap, print cloth, rosin, rubber, soybean oil, steel scrap, steers, sugar, tallow, tin, wheat, wool tops, and zinc. There are two primary sub-indices of the CRB Spot Index, both of which are shown in the charts above (Raw Industrials 59% and Foodstuffs 41%). As should be apparent, no matter how you slice it, commodity prices are rising strongly across the board these days, and reaching new all-time highs almost daily. The folks at CRB built their indices on the assumption that basic commodity prices were good leading indicators of changes in economic activity. What they missed, however, was that commodities can also be good indicators of changes in the effective stance of monetary policy. When almost all commodities are behaving in a similar fashion, Occam's Razor would suggest that there is probably some simple, common denominator working behind the scenes. How easy is it to believe that the producers of almost every single commodity out there are failing to keep up with the demand for their product at almost exactly the same time? An easier explanation is that monetary policy is the common denominator. 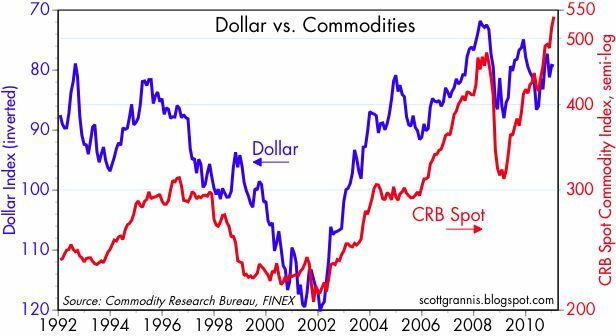 As partial proof, consider the chart below, which shows that there has been a relatively strong inverse correlation between the value of the dollar and commodity prices. Moreover, the dollar started weakening, and commodities started rallying, right around the time (late 2001) when the Fed began lowering interest rates in earnest: the Fed funds rate was slashed from 6.5% in late 2000 to 1.75% by late 2001, and was subsequently lowered to 1% from mid-2003 through mid-2004. Monetary policy was unquestionably easy for five years, even as the economy picked up steam beginning in the second half of 2003. It should not be surprising, therefore, that the dollar collapsed, and gold, commodity and housing prices soared—it was a classic example of what happens when a central bank dumps tons of excess money into the market. Money loses its value, and the price of things goes up. Scott Sumner—a rising star in the economics profession, in my estimation—has penned some insightful comments on the subject of commodity prices and monetary policy, and he is one of the very few competent advocates of the theory that the Fed should target nominal GDP instead of inflation. His logic leads him to assert that the huge drop in commodity prices in 2008 was a clear sign that monetary policy was way too tight. I happen to agree with him, even though that is a very controversial opinion to have held at the time. Although I never said the Fed was way too tight in so many words, I argued in Oct. '08 that the Fed's massive balance sheet expansion was a good thing, since it was an appropriate response to the huge increase in money demand that was behind the huge decline in commodity prices. I went on to say that the Fed's quantitative easing should "at the very least forestall or reverse any deflationary tendencies that might result from the current financial crisis." 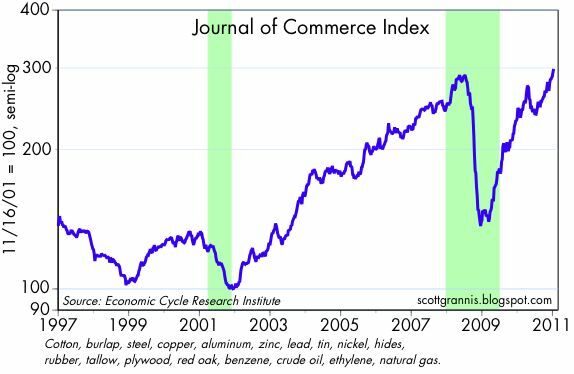 And indeed, commodity prices hit bottom in early Dec. '08; subsequently, the consumer price index started to rise in early 2009, and by June '09 the economy began to recover. I think there is no question but that the Fed acted appropriately, even though, in retrospect, they probably should have acted sooner than they did. Their delay in implementing a massive easing program most likely exacerbated the decline in commodity prices and deepened the panic/recession. I would further note that the dollar rose at the same time commodities collapsed in late 2008, with both actions the logical result of a sudden and effective shortage of money relative to the demand for money. 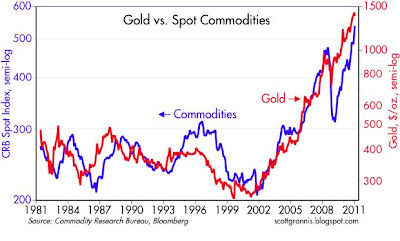 The next chart shows how gold and commodity prices have moved together, with gold tending to lead. 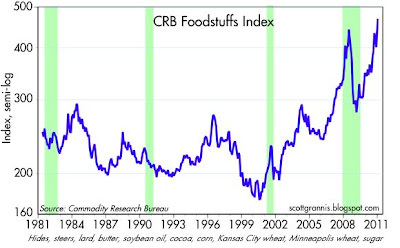 This is more evidence that big swings in commodity prices can have a monetary origin. Why should gold move in sync with or in advance of commodities, if the movements of both weren't the result of an excess or a shortage of money? What does all this mean? For one, the strong upward trend evident in both gold prices and commodity prices is a signal that quantitative easing is working. Working with a vengeance, in fact. If the significant fall in gold and commodities in late 2008 was a signal that the Fed was failing to provide enough liquidity to the market, then the even greater rise in gold and commodity prices over the past two years is telling us that the Fed has by now provided more than enough liquidity. QE2 should be halted and possibly reversed. The risk we face, however, is that the Fed will be very reluctant to reverse course, fearful that all the "slack" still out there continues to pose a deflationary threat to the economy. Plus, tightening monetary policy at a time when unemployment is still sky-high would be fraught with difficulties from a political perspective. So if the Fed continues to ignore the signals that it has eased enough (e.g., a very weak dollar, strong commodity and gold prices, rising forward inflation expectations and a very steep yield curve) does that mean the result will be hyperinflation? I'm not prepared to say that yet, but I do think that it implies one should have at least one oar in the water pulling in the direction of assets that will benefit from a rising price level. Treasuries are most definitely not one of those assets, but equities, corporate bonds, and inflation-adjusted bonds are. While it's scary to see gold and commodity prices shooting higher, it's not necessarily the end of the world. In real terms, gold and commodity prices are still well below their historical highs. 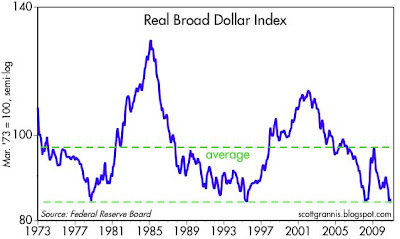 The dollar is very weak, but it's been this weak several times in the past without resulting in a catastrophe. It's also the case that while monetary policy can have an almost immediate and profound impact on commodity prices, it can take a long time for monetary mistakes to filter through the massive U.S. economy. For example, the Fed's aggressive tightening in the late 1990s didn't cause a recession until 2001—and a mild one at that—and we didn't see a meaningful decline in the inflation statistics until mid-2003. If took four years of super-easy monetary policy, beginning in 2002, to result in an unsustainable housing price bubble in 2006. Sometimes problems can persist for much longer than one might expect. Meanwhile, I think the dominant themes of the past year or two will continue to play out. Deflation fears are vanishing, and confidence is slowly returning. The economy is improving, and growth can trump a lot of problems. Fiscal policy is in the process of improving meaningfully. Contrary to what you see in the press, even sharp cutbacks in federal, state, and local spending needn't be bad news for the economy; reduced spending by the public sector frees up resources for the far more efficient private sector. Starve the public sector beast and you feed the private sector job-creating machine. So I remain optimistic, especially since so many people are still so worried. UPDATE: Ronald McKinnon (a great economist whose books I studied in 1979-80) has an excellent article in the WSJ which expands on the ideas discussed in this post. The Phillips Curve theory of inflation says that inflation is a by-product of strong growth. When an economy "overheats" and things are humming along at or close to "capacity," then supply can't keep up with additional demand and producers start raising their prices. Conversely, when the economy goes into a slump and a lot of economic "slack" develops, then everyone has spare capacity, there's lots of price competition, supply exceeds demand, and prices tend to fall. It's all very intuitive, but from a monetarist's perspective, its dead wrong. It's true that if the supply of apples exceeds the demand for apples, then the price of apples is very likely to fall. But that's a statement about the relationship between the supply of and the demand for apples; it doesn't say anything about the relationship between the market for apples and the amount of money in the economy. Inflation is a condition wherein the supply of money exceeds the market's demand for money, so an excess of money tends to drive all prices higher. Imagine if the amount of dollars in circulation increased by 100% overnight: the price of just about everything in the economy would quickly start rising, and in the end, the price level would end up rising by 100% or so. Even if there were more apples on the market than people wanted, the price of apples would rise if the money supply doubled. I've lived in hyperinflationary times (the late 1970s in Argentina), and I know that prices can rise even if the economy is in a deep recession. The Phillips Curve theory got a big boost in the 1970s, because the relationship between inflation and capacity utilization (see the chart above) was very tight. There was a reliable, 17-month lag between changes in capacity utilization and the inflation rate. That lag reflected the fact that it takes time for the economy to adjust to changes in underlying monetary conditions. But then the relationship stopped working, starting in 1982. Capacity utilization rose through 2000, but inflation fell. Since then there has been a modest correlation between the two, but nothing like what we saw in the 1970s. My explanation for why the Phillips Curve worked in the 1970s is that the Fed was following a very reactive strategy: tightening after inflation rose, then easing after inflation fell. They were always adjusting to the realities of the economy after the fact; easing for too long, and then abruptly tightening after inflation was rising and entrenched. But in the 1980s the Fed started pursuing a very tough line against inflation, proactively tightening even before inflation rose (e.g., the late 1990s). In 1998 and 1999 I started worrying that they had tightened way too much, and that deflation was a serious risk. By 2002 deflation was indeed a major concern for the Fed, and so from about 2003 on, the Fed became reactive again, easing in response to the fear of deflation, even as there were many signs that policy was too easy (e.g., rising commodity, gold, and housing prices), and so the correlation between capacity utilization and inflation has increased somewhat. Still, the huge swings in capacity utilization and inflation in recent years has been nothing compared to the 1970s. But it remains the case that the Fed is once again behaving in a reactive, rather than proactive manner. The FOMC assigns much more importance to the relatively low rate of capacity utilization and the amount of economic "slack" there appears to be today, than to the impressive and ongoing rally in commodity prices and gold prices, or to the historically weak level of the dollar. (And recall that it was the collapse of the dollar in the 1970s that really got inflation going.) 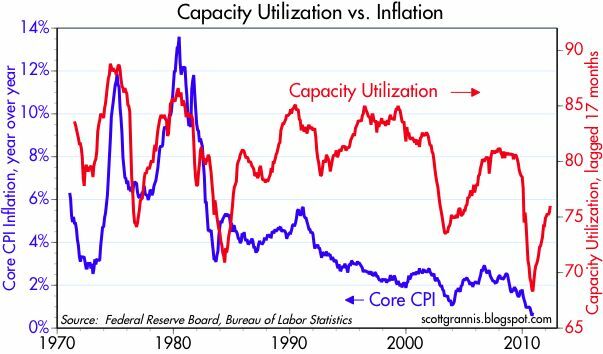 So it's reasonable to think that the recent surge in capacity utilization ought to be followed by at least a mild uptick in inflation. Given the 17-month lag between capacity and inflation that played out so well in the 1970s, we may well have seen the low in the CPI for the next several years. And that is exactly what the Fed wants to see—higher inflation. Never doubt the Fed's ability to get what it wants. The CPI rose 0.5% in December, somewhat more than expected. Most of the rise was due to a big jump in gasoline prices. 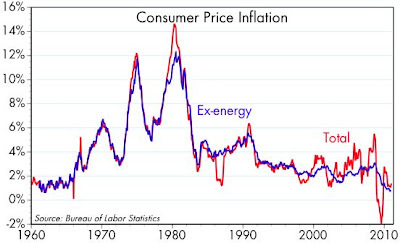 Ignoring energy prices, the CPI rose a mere 0.8% last year, and the headline CPI rose only 1.3%; that takes us all the way back to the very low and relatively stable inflation rates last seen in the early 1960s. These tame statistics don't tell the whole story however. In the past six months, the CPI has increased at a 3.1% annualized rate. More importantly, the CPI ex-food and energy has been rising steadily (albeit at a bit less than 1% per year) for the past several years, even as energy prices have been soaring. If the Fed were pursuing a policy of price stability (which they are not, unfortunately), then a big rise in energy prices would necessarily result in a decline in non-energy prices, thus leaving the overall price level unchanged. But that's not happening. By being accommodative, the Fed is allowing higher energy prices to occur, without forcing other prices to decline. This is a recipe for more inflation. 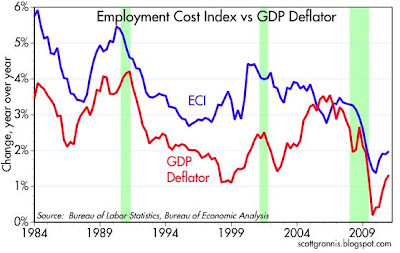 If nothing else, this fact—that monetary policy is definitely accommodative—all but rules out the risk of deflation. As deflation risk fades into obscurity, markets are waking up to the fact that it's possible to raise prices and get away with it. Thus, nominal growth expectations are rising, inflation expectations are rising, and the combination is driving higher earnings expectations, thus lifting stock prices. Inflation and inflation expectations are still relatively tame, thank goodness, but this we are not in a stable, long-term equilibrium condition. Facts and expectations can change dynamically, but we don't know whether the Fed can adapt with sufficient speed and determination to changing conditions. This is no time to be lulled into a sense of low-inflation security.